Today I have a watercoloured baby card with the Picket Fence Studios Jungle Babies Stamp Set. I made a baby girl card because one of my Church friends will give birth to a perfect, healthy girl next month!! I started by die cutting a stitched scallop panel from watercolour paper using the MFT Blueprints 27 Die-namics. I then randomly stamped all adorable critters from the Jungle Babies set on watercolour panel using VersaFine Onyx Black. For tiny hearts & flowers, I used the Cup Cake Love stamp set. I watercoloured the stamped images with several Distress markers – one of my favourite watercolour markers for sure! Once the panel was dry, I mounted it on SSS Cotton Candy card base using Glue Dots Permanent Tape Runner, and then added Glossy Accents to baby elephant’s red bow, pants, paws, baby hippo’s wings. Thank you so much for stopping by. Have a fabulous day! Welcome to the first day of the Pretty Pink Posh June 2018 Product Release Blog Hop! 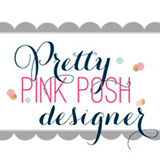 If you arrived here from the Pretty Pink Posh blog you are on the right track. My card today I’m featuring the new School Friends Stamp Set. I started by die cutting stitched rectangled panel from watercolour paper using the Stitched Notes die set. I stamped the sentiment onto the centre of the watercolour paper panel in black pigment ink first, and then stamped other images from the School Friends set randomly around the sentiment area. I coloured them with Distress markers & Hero Arts Watercolor Wheel. Once the panel was dry, I mounted it on red card base using double-sided tape. We’re giving away a not-yet-released set for orders over $60 in June (while supplies last). Today I want to share with you my floral wreath card using the Altenew Beautiful Day stamp set. Once dry the coloured panel, I mounted it on an A2 sized white card base using double-sided tape first, and then layered the vellum circle & sentiment circle die cuts using dimensional foam tape. To finish it off, I embellished with a few PPP clear sequins. Welcome to the My Favorite Things June Release Countdown Day 5. My cards today featuring new Beautiful Girl Stamp Set & Die-namics, Sweet Forest Friends Stamp Set & Die-namics, Birch Trees Die-namics, Stitched Valley Die-namics. For my first card, I stamped the girl from the Beautiful Girl set on watercolour paper using black pigment ink, coloured it with Distress markers, die cut it with the Beautiful Girl Die-namics. For the floral background, I heat embossed the flowers and leaves from the Funky Flowers & Beautiful Girl sets in white, ink blended the panel with Mustard Seed, Victorian Velvet, and Worn Lipstick Distress inks using the mini ink blending tool, then added a bit of clean water. For the sentiment, I also used the Beautiful Girl stamp set. I mounted all elements as shown to A2 white card base using dimensional foam tape, then embellished with a few PPP clear sequins for finishing touches. For my second card, I used the Sweet Forest Friends Stamp Set & Die-namics as my main supplies. First, I watercoloured the birds, butterfly, and cute critters from the Sweet Forest Friends set on watercolour paper with Distress markers, then die cut them with the Sweet Forest Friends Die-namics. For the forest, I cut the Birch Trees out from the Kraft card stock, the Stitched Valley out from watercolour paper at first. I then inked the edge of the birch trees with Vintage Photo Distress ink, blended the Stitched Valley with Twisted Citron & Mowed Lawn Distress inks using the mini ink blending tool. For the sentiment, I used the Sweet Forest Friends stamp set. I mounted all elements as shown to top-folded Kraft card base using dimensional foam tape, then embellished with a few PPP clear sequins. “Memories are made when friends gather.” – Oh, I love this sentiment so much. It’s so sweet, isn’t it?! Today I’m just popping in to show you a cute birthday card with a newly released SSS Cuddly Critters & Cuddly Critters Accessories stamp sets. There’s nothing like a balloon for creating a happy birthday card and I especially love the heart-shaped balloon in the Cuddly Critters Accessories set!! To create this card, I 1) Masked off the balloons and clustered them together at the top half of the watercolour paper panel. 2) Stamped other accessories around a bunch of balloons in VersaFine Pigment Ink Onyx Black as well. 3) Watercoloured them with Distress markers. For a detailed list of the supplies I used, please see the supply list at the end of this post. 4) Stamped the panda and bird on a separate watercolour paper in VersaFine Onyx Black, then coloured them with Distress markers before die cutting with the matching dies – I stamped the panda three times using a Mini MISTI tool. 5) Mounted all elements as shown to A2 white card base using dimensional foam tape. 6) Embellished with the PPP sequins. Don’t you want to fly in the sky by grabbing on to a bunch of balloons?! !